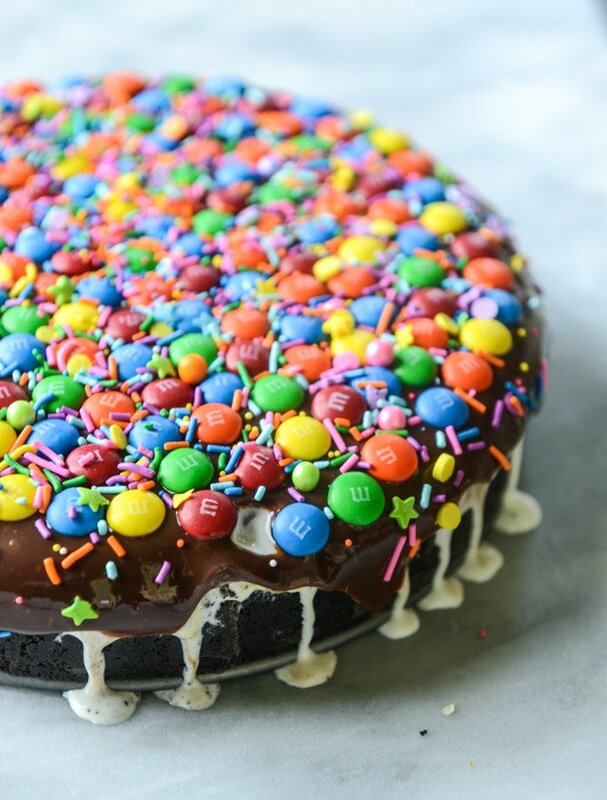 Confetti Ice Cream Fudge Pie with M&M’S. There is only one thing better than ice cream season. Or, ice cream pie season. Same thing, filled with the most delicious melty ice cream, sprinkles and a thick and fudgy filling. I die. This is why I’m a bit nutty over ice cream pie. And it may sound weird. I don’t really love cake and ice cream together. I mean, I like cake swirled into my ice cream? But at a birthday party, I rarely want a scoop of ice cream with my cake. I’m happier with just the cake or just the ice cream. They are two separate desserts for me and I have no interest in swirling them together on my plate. In fact, I’m so out of the cake-plus-ice cream loop that many times, I’ve hosted birthday parties and actually FORGOT to buy the ice cream. Seriously. Completely and utterly humiliating. So I do things like this! Just make one big old ice cream pie that works as both desserts – and then there is only the need to slice and serve once. 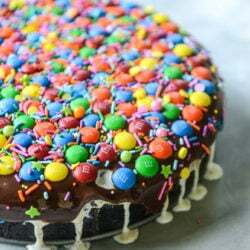 I’ve partnered with M&M’S again to create a fun birthday-inspired dessert that you can share with all your invisible internet friends just like I am today. You’re never going to see me saying no to rainbow colored chocolate candies, uh uh. This to-die-for dessert concoction is super simple and can be made the night before a party – all it takes is a bit of assembly. I love a chocolate cookie crust. I also love a graham crust, so there is really no way to go wrong here. Pick what you like and what flavor you are feeling that day. There will still be chocolate fudge, so no worries. Next up, cake and sprinkles in your ice cream. It’s a thing! I swirled two cupcakes and some sprinkles into homemade vanilla ice cream before slathering it on top of the cookie crust and sticking it in the freezer. You can use whatever ice cream you’d like, but sprinkles make everything better and that’s a fact. THEN. Then comes my favorite part. The gooey, sticky, most decadent chocolate fudge. This was completely inspired by the old-school chocolate cookie ice cream dessert (<horrifying) my mom made when I was a kid. It always had a thick fudgey layer inside and it was the only part I wanted to eat. So I’d scrape off the whipped cream, eating the chocolate and leave the ice cream there to melt for someone else. Good thing I changed my ways. On top of the fudge are tons of bright and colorful M&M’S. 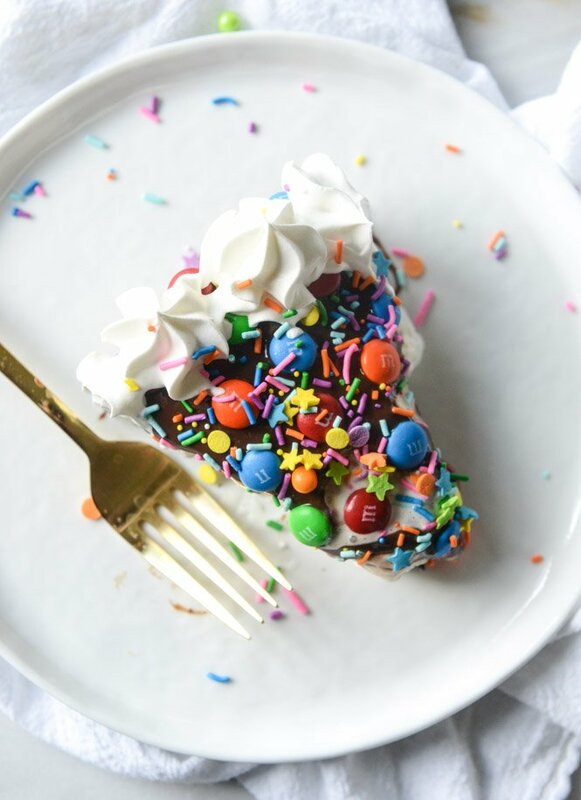 Cold and crunchy M&M’S are my favorite and they give this trashed up pie the BEST texture. Crunch crunch crunch. Plus, finished with a handful of extra sprinkles, fresh whipped cream and all the heart-eyed emojis in the world? I’m in looooove. Can we consider THIS eating color?! Add the cookies to your food processor and blend until crumbs remain. You want the consistency of graham cracker crumbs! Place the crumbs in a bowl and stir in the melted butter. The crumbs should all be moistened evenly. Press the crumbs into a 9-inch springform pan and stick the pan in the freezer for 10 minutes. In a bowl, gently (and quickly!) fold the crumbled cake and sprinkles into the softened ice cream. Spread the mixture onto the cookie crush and smooth out the top. Place it in the freezer for 1 hour. Heat the condensed milk in a saucepan over low heat. Stir in the dark chocolate and vanilla extract. Stir until the chocolate is melted and remove the pan. Let it cool almost completely (you still want to be able to stir it). Remove the crust from the freezer and pour and spread the chocolate evenly over the top. Place in the freezer for at least an hour. Time for the M&M’S! Place the chocolate candies on top of the fudge. Add a few sprinkles! Freeze for another hour or even overnight at this point. Top with whipped cream before serving. I slice it right from the freezer, but you can let it sit out for 10 minutes before serving in order for it to be soft and melty. Enjoy! Oh hi cake and ice cream. This is how I like you. 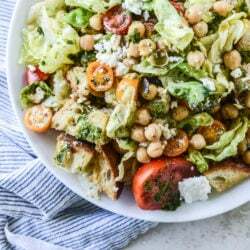 Panzanella with Marinated Chickpeas and Chimichurri. You can’t actually refrigerate an ice cream cake overnight and have it be fine, can you? ack i meant freezer! thanks haha! omg love this! my birthday is coming up and I have been contemplating making my own cake this year. this is totally up my alley for a terrific dessert! I have always had a thing for m&m’s. How much in advance can I make this?? 1-2 days? 4 days? Looks amazing!! Might opt for patriotic sprinkles for Memorial Day! I think M&M’s stand for me and mine, as in this cake is for me and it’s all mine! Ahhhhh YEAH!!!! This cutest ever ice cream pie has completely stolen my heart away! LOVE it! This looks so amazing! And I agree on the mixing of cake and ice cream, ice cream cakes are where it’s at! Did you just buy the cupcakes? hey girl this looks so yummy! I’m like you I usually don’t have ice cream with cake! I NEVER remember the ice cream either. I have a 13 year old, a 10 year old, and a soon to be 7 year old and I have never bought the ice cream to go with the cake. I’m sorta like you though. Just give me one or the other. Maybe one for dessert after lunch and one after supper! Ha! ? This looks so yummy though I think I can handle cake and ice cream together especially since birthday cake is my favorite flavor of ice cream! This looks amazing and looks great for Memorial Day weekend! Also I want to say thank you for keeping your blog such a great place. I really appreciate that when you partner with companies you make it so obvious AND you do it in addition to your regular programming. It makes it feel like you really do think of us all as your invisible internet friends, instead of just some blog to make money! I also wanted to share that I’ve gotten every single one of my friends hooked on your recipes! I went to a bridal shower last weekend and every recipe that anyone shared with the bride (on those little recipe cards) was from your website or your book! I think for our next friend’s bridal shower we’ll just do a potluck of just your recipes! Thank you for everything you do! Do you think this would keep okay 2 nights in the freezer, or do you start to have a freezer burn issue since the ice cream was a bit melted and then re-frozen? Want to make it for a birthday in a few weeks but I am a bit worried as I don’t have time the night before. i would do it up until to m&ms part, cover in plastic wrap, and you should be good! I saw you post this on instagram and lost it! I haven’t had a good ice cream cake since grade school and I definitely think that is going to change soon!! I am so with you on the whole cake and ice cream situation. Everyone looks at me weird, but I am good with just cake or just ice cream. I don’t want ice cream melting on my plate with my cake. Looks delish! and will be making for my soon to be 5yo! Question – when you call for 2 vanilla cupcakes – do they have icing on them? or just plain? Thanks! So colourful! Next on the to bake list!! !